Arduino boards by themselves are, of course, great for making a wide array of projects. Sometimes, however, you’ll need to add other integrated circuits (ICs) for extra functionality. 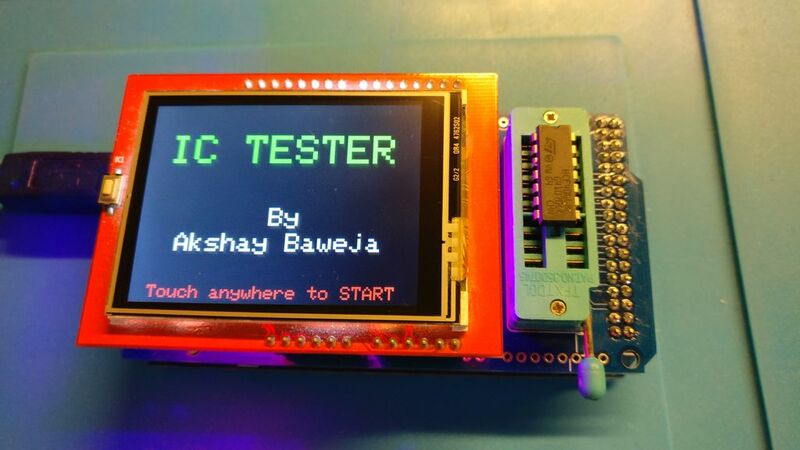 If you want to be absolutely sure that the IC you’re using in your project is working correctly, this tester by Akshay Baweja will input the signals to the device, and analyze the outputs that it produces on a 2.4” touchscreen. While this type of equipment would normally be quite expensive, Baweja’s Arduino Mega-powered gadget can be built for around $25 in the form of a shield. His custom PCB includes a 20-pin ZIF socket and a 2.4″ TFT touchscreen with an integrated micro SD slot. You can see it being demonstrated in the video below, and code can be found on GitHub if you’d like to create your own. How about a parts list and diagram. Other people want to make this! Nice job! This is EXACTLY what I wanted to design/build as a teenager. But, alas, the technology to easily do so just wasn’t there 40 years ago… (and the microcomputers hat were just starting to come out then were WAY out of a kid’s price range.) The kids (and adults!) of today sure have a lot more opportunities now. that’s very impressive project. nice and keep it up. I Try this code get from code can be found on GitHub and verify for upload ardiuno Mega2560. But ther code show some error in verify stage. can anyone help for complete this project? ?